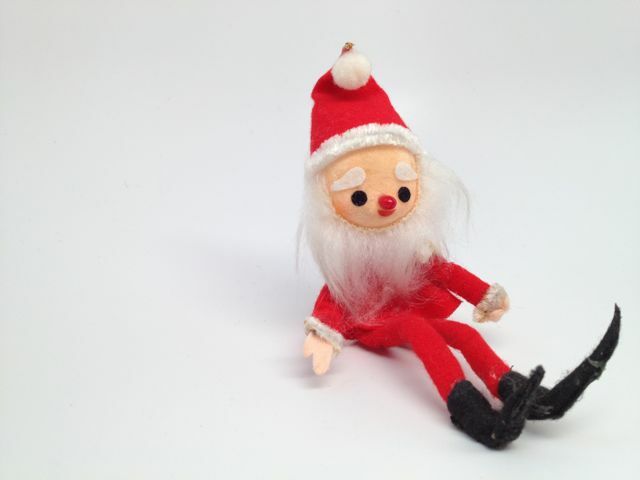 Found: One small vintage skinny santa. Made in Japan. It was love at first sight. And how about these deer?! An upstate NY summer yard sale find. They were all tied together with gold thread attached to a sleigh filled with crocheted tiny packages and a small round santa. They clearly did not go together but the sight of it all made me smile... and the little miss really enjoys playing with the presents! We packed up the car with our western gear and hit the road this past weekend. Themed weddings can be really fun! The little miss enjoyed all of her accessories, especially her hat and horse, and of course, the fringed leather satchel that she could keep her lip balm in. Our fabulous babysitter looked super cute dressed in a vintage square dance dress that I found on etsy. It was one stop shopping for me at Lodekka, where I found that amazing vintage gunne sax and sweet pair of red boots! Bright colors and good form found in something so simple. I found this stack while sorting through the storage space. The tag on the plastic bag read: Vintage Mod Blocks. The little miss dumped them out and stacked them higher than I've seen her stack any other blocks. Obviously, I had to get them. x is for x-ray, n is for cute, mod nurse, and l is for retro lamp! Maybe you're like me and when you're out and about rummaging you may pick up a set of vintage paper napkins; be it holiday, cocktail with random one liners on them, or just some print that tickled you're fancy. Never used, they are perfect, still with their original price tag of 59 cents (or something silly). I even have one collection that I found all wrapped up in an old wonderbread plastic bag, how could I resist? I always scoop them up. I don't think I have ever used any of them for their intended purpose. Actually, I don't think I've ever used any them at all! They just sit in the magic closet in a box labeled "assorted paper and other interesting things" awaiting some creative repurposing. Why not a gift bag? It's simple. It's made of scraps. It's a bit sloppy, but let's just say that's the charm! I cut one piece of canvas with pinking sheers, sewed the front of the napkin to one side and the back to the other with a zig zag stitch, attached pipe cleaners for handles, bundled up some ribbons and tacked them in what would be the bottom corner, then folded the whole thing in half and stitched it together. A perfect size for a small gift or even some stems of flowers. Happy Birthday, Mom! We gave this rusty, paint chipped, old stainless steel sink frame a new purpose with some plywood and a piece of masonite, coated with some poly to seal it, and now it sits beneath the skylight next to the old locker that we found. The rat tail cactus hangs down from the locker; friends have often referred to it as the dreadlock plant. A spotted prickly aloe sits in a pot next to the squirrels and the once amazing succulent wreath is now sun starved in this oh so rainy town. I found the things that look like shavings from sharpening a giant pencil at a yard sale but I'm still not quite sure what I will do with them. The spools of thread had to be hidden underneath to keep the little miss from getting into trouble. Old wooden drawers store the rusty railroad nails that we picked up along the Hudson River. The mister found the red lantern light on his last trip to Hoffman's. 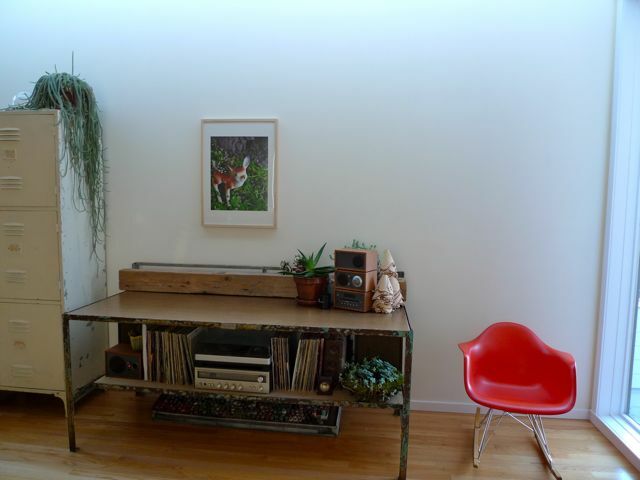 A little upstate dumpster diving gave us the large wooden barn beam that is so lovely and textured.